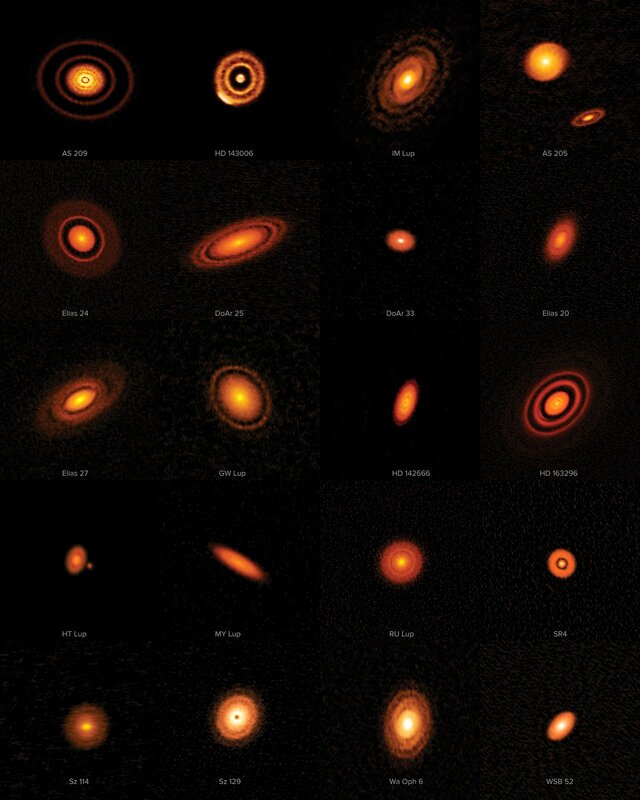 This week’s image shows 20 spectacular protoplanetary discs captured by ALMA’s first Large Program, known as the Disk Substructures at High Angular Resolution Project (DSHARP). In a focused observation effort that included hours of data collected over several months, researchers imaged 20 nearby protoplanetary discs to learn more about the earliest stages of planet formation, and the staggering quantity of data from the project has just been released. It has long been thought that planetary systems are likely to have their origins in so-called protoplanetary discs — compressed circles, spirals or ellipses of gas and dust, which form around protostars in the early stages of their development. The process by which planets emerge from these diffuse discs, however, is not well understood. It is particularly challenging to understand the very earliest stages of their evolution — when dust within a disc coalesces into planetesimals and the seeds of planets are formed. Astronomers know that a planet’s first growth spurt, from individual grains to a body a few kilometres across, must happen quickly in astronomical terms, but the lack of observational data has made pinning down the physics of this growth challenging. Fortunately, this recently changed with the opening of new telescopes such as ALMA. Eventually, astronomers hope to be able to accurately predict what type of planetary system will evolve from any particular disc. The DSHARP program takes us a step towards this goal by providing a detailed view of the substructures (the varied patterns of dark and light circles and spirals you can see in each disc) — helping us to understand their significance. The story continues next week — this is the first instalment in a trio of Pictures of the Week that will delve into recent discoveries made by DSHARP.